Jake and I kicked off our Turkey Day a little early yesterday with a visit from a friend from Indy. You know how you have protocol with visits from specific friends? Well, with this guy, Jake and I always end up with our laptop open, and he brings his as well. Before we know it, it's like this little geek symposium. "Have you heard this?" or, "Did you see this?" BBC clips and new Iphone tricks and german music videos abound. And inevitably, we end up discussing and eventually watching at least one MST3K episode. The time before last, we introduced him to "Space Mutiny", undoubtedly one of the best episodes ever. 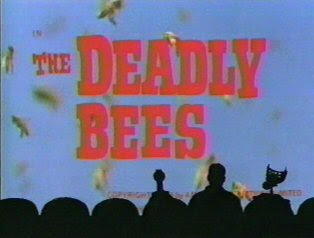 This time, we watched, "The Deadly Bees". And while I can't say that it was one of my favorite episodes, my head still hurt from laughing. It's like free therapy. It also takes me back, I first discovered the MST3K movie, "This Island Earth" in high school with a really good friend of mine. Totally out of the blue at a random video store, because none of us had cable. It wasn't until college though, that a good friend of mine, Joe, started having Sunday night MST3K viewing parties. That's when I really climbed aboard the bandwagon of hilarity. I've probably seen 40 or so, nowhere near as many episodes as exist. And I can say with confidence that I am a "Joel" gal, though I do love "Mike" as well. Equally funny in different ways. And I do buy Rifftrax and Cinematic Titanic when my virtual money starts burning a hole in my Paypal pocket. I just can't imagine life without overdubbed movies, and sarcastic quips...and actually, I don't even want to imagine such a thing.